Shopping for Doctor Who Lunch Boxes? Three fan-demanded Doctor Who collectibles in one! This exclusive tin tote looks just like a TARDIS. 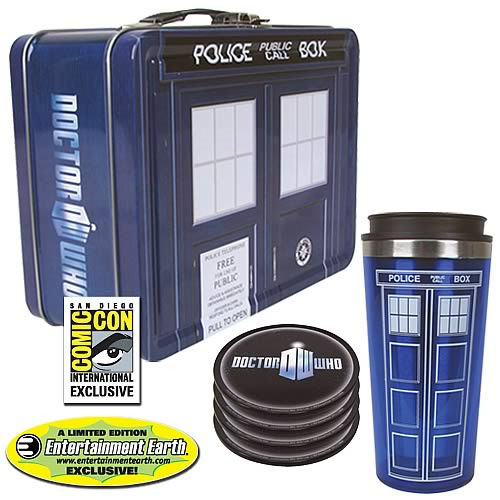 Includes Doctor Who-themed coasters and a TARDIS-design travel mug! Carry them with you wherever your intergalactic travels take you! Entertainment Earth Comic-Con Exclusive! Three fan-demanded Doctor Who collectibles in one awesome package! This embossed tin tote looks just like a TARDIS time machine, and with plenty of authentic detail, it measures 8 5/8-inches wide x 6 3/4-inches tall x 4-inches deep. The colorful lunch box is magnificent enough by itself, but inside you'll find a 4-pack of Doctor Who-themed coasters and a 16-ounce TARDIS-design travel mug! Carry them all with you wherever your intergalactic travels take you. The included 4-pack of coasters ought to get the conversation rolling at your next party! Measuring approximately 3 3/4-inches in diameter, these attention-grabbing Doctor Who-themed coasters are made of furniture-protecting EVA foam and feature the modern Doctor Who logo. The Doctor would certainly use them on the console inside his time machine, and so should you! If you have a time machine, that is. This 16-ounce travel mug looks like the Doctor's TARDIS time machine in the BBC's Doctor Who sci-fi TV series! With an image of the TARDIS on the front and the Doctor Who logo on the back, the mug features a blue plastic exterior and a durable stainless-steel interior. It's just what you need for your own travels through time and space! TARDIS stands for Time And Relative Dimension In Space. The TARDIS looks just like a wooden police phone box from the 1950s on the outside, but is of infinite proportions on the inside. This incredible time machine is piloted by the Doctor, a mysterious Time Lord, and is able to transport him anywhere through time and space, disappearing in one place and reappearing somewhere new. Produced by the BBC, Doctor Who is the longest-running sci-fi TV series in the world. The award-winning show presents the adventures of a time traveler known simply as "the Doctor." Along with his companions, this mysterious Time Lord journeys through time and space using his TARDIS, which appears from the outside to be an ordinary police phone booth.